Every aircraft has a beginning. The F-104 Starfighter is no different. 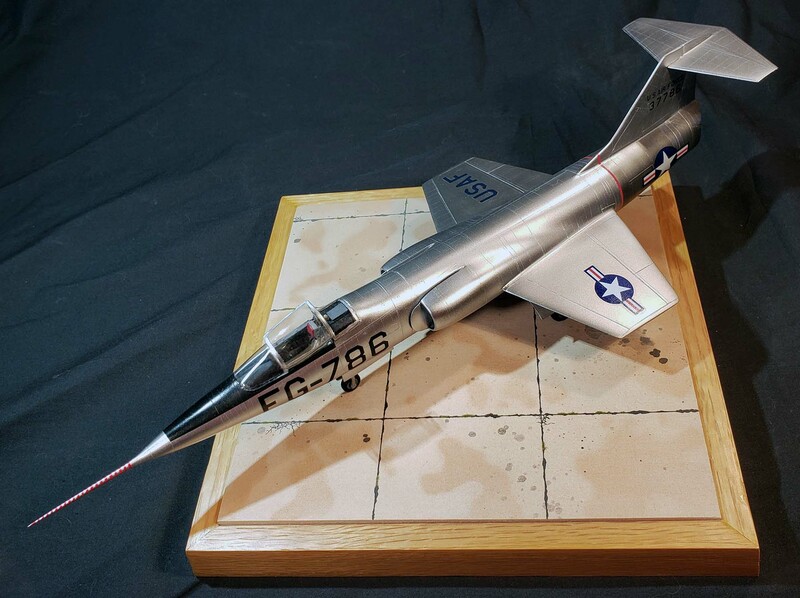 When the Air Force put out a requirement for a single-engine high-performance supersonic interceptor, Lockheed stepped up with a radical new design heavily influenced by Clarence "Kelly" Johnson. Better known in the hallow halls of the Lockheed Skunkworks as "Mr. Johnson." USAF fighter pilots complained about their aircraft being on par or slightly better than their Russian counterparts they met over the skies of Korea, Lockheed took notice. They started a development program for the perfect high-speed interceptor. Nothing but cutting edge design, super sleek, Gatling gun loaded, easy to produce and maintain. The design started to take shape with all the elements that Kelly Johnson approved of. And in typical Skunkworks fashion it was only one year from award of contract to the first flight. This was an amazing feat for any manufacturer at any time. The first XF-104, 53-7786 officially took flight on March 4th starting the Starfighter's long career in service of many different countries. 53-7786 was lost on 11 July 1957 when a known Achilles heel appeared, an uncontrollable flutter in the tail fin that ripped it from the fuselage which forced the pilot to eject using the unique downward firing ejection system. Over 2,500 Starfighters were produced and served with 15 different countries while being manufactured in 7 different countries under the Mutual Defense Assistance Act. This aircraft had a long and turbulent flight history with a high loss rate due to training and operational environments. Regardless it did leave a mark on aviation history with its innovation and unique design. 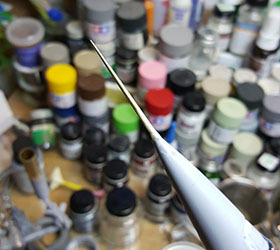 I looked at different kits to use as the base for my backdating project. The Hasegawa, ESCI, Monogram kits didn't have the small tail look I needed or the shape of the front canopy of the early XF-104 prototypes. 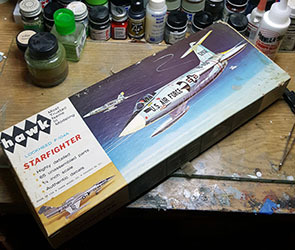 After a long search, the only kit that would work at all was the very old Hawk F-104A and a complementary set of drawings I found on the Internet, the most important tool I have in my arsenal, a new razor saw. This kit goes back to 1961 in its origin. Mine is the 1964 boxing and it looks every bit of its 53 years. 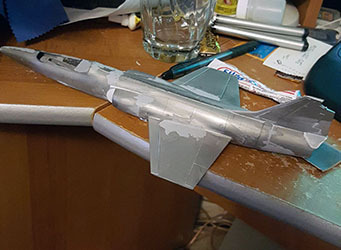 Made with very brittle greyish-silver plastic and a yellowing clear canopy with a bare minimum of parts and a vague shape that looks like a Starfighter, this would be my starting point due to the short tail and forward windscreen. Oddly enough it came with a boarding ladder and a standing pilot. In the scrap box it goes! There was going to be a lot of work ahead on this build. 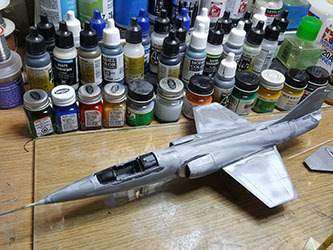 There were so many modifications that were needed to convert the F-104A into an XF-104 and many more modifications that were needed to correct the old moldings. This proved to be extremely challenging. You know what they say about eating an elephant…one bite at a time. The first order was to get all the measurements down and cutting it up to match the correct stubby length of the first two prototypes. I had to refer back to my plans I found on the internet often. 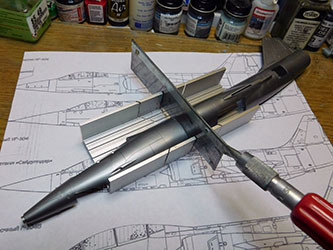 Using my plans, I cut the fuselage into sections. Then I worked each section until they were ready to go back together. Well that was the intent at least. Lots of work went into every section so I will cover those individually. 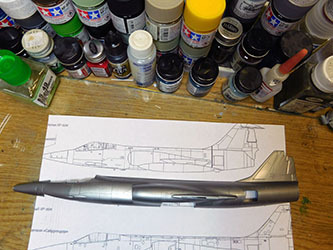 I cut the nose off at the intakes since the XF-104 was shorter from the intakes forward. Then I cut off the incorrect one piece intakes to replicate the splitter plates. This took some inner structure scratch building to build up the area to mount the corrected intakes to. The real deal didn't have the distinctive spike in the intakes but had a curved splitter plate and open intakes giving the XF-104 a very different look in that area. Superglue, plastic card and sand paper were my friend during this part of construction. I fit an F-104C cockpit that I had and I found an early Lockheed C-2 ejection seat that I backdated to a C-1 downward firing seat using more references found online. It took some cutting and grinding but I got it all to fit. I also plugged up the large notches the original open kit canopy was supposed to sit in. 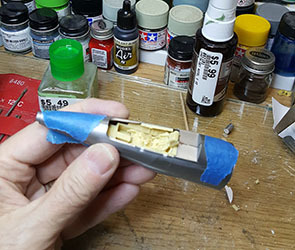 I also used a resin nose wheel well that I had to modified because the early Starfighters had the landing gear in the forward section of the nose wheel bay. The two seaters maintained this configuration while all later models had the wheel strut at the back of the wheel well. 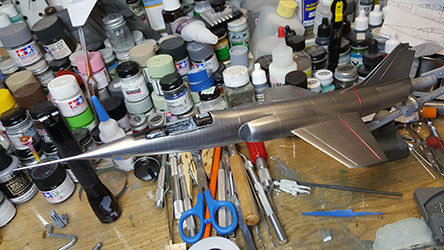 To get the aft fuselage the right length, I cut it along a panel line that also shortens the airbrakes to the same size as the XF-104. They were much smaller than the production F-104A. A tricky cut had to be made to keep the tail fillet intact. 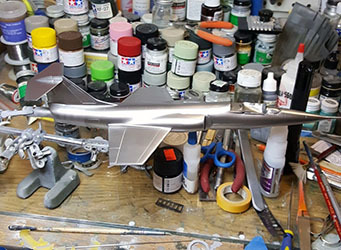 With the fuselage halves together, I used a Black Box main wheel well to replace the non-existent wheel well area and shimmed up all the open areas with plastic card stock and filler putty. Then it was time to stitch it all together. Alignment was the most difficult thing with each section having to be aligned and held into place for the superglue to set up. Time and patience won the day on this section of the build. Now comes the sanding. And the putty. And the sanding. And the putty. And….you get the point. It was a slow massage to sand all the parts to fit up right. Lining up the different segments and getting the wings mounted with the right dihedral. I ended using some Legos to make a makeshift jig. 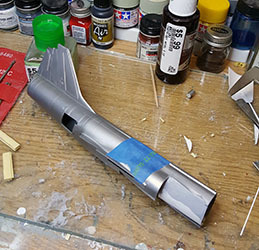 Once I got the wings at the correct angle, I superglued the nosecone in place, taking extra care to get it aligned along the center axis of the fuselage on the horizontal and vertical. It proved difficult since the nose shape is not a perfect cone. I also put some solid brass rod in my Dremel tool and spun an extra-long pitot tube using files and emery paper to get the taper just right. Some epoxy got it glued in and more putty and sanding blended it in. Now I had a deadly weapon that in fact stabbed me on more than one modeling session. I small cork went on the tip inspired by a scene from "Dirty Rotten Scoundrels" Thank you Steve Martin! 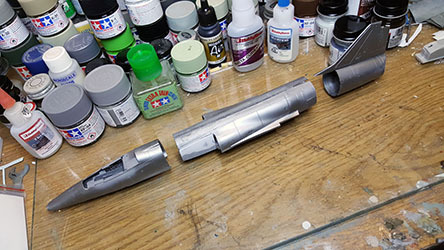 I have been using Tamiya spray primer for some time now and used it multiple times on this project to get the seams all smoothed out. Once I was happy with the surface I painted it Tamiya Gloss Black and then used different shades of grey and white to replicate the different metals. The whole thing got a coat of Vallejo Silver. I masked off the warning stripes on the wing and fuselage engine area and then used my rivet maker to replicate the different rivets. 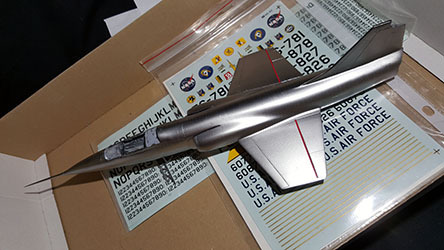 I went light because of the extremely smooth surface of the Starfighter. 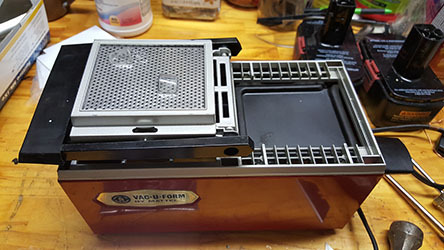 Using my trusty old Mattel Vac-U-Form, I made new canopies and landing gear doors. I made two sets of doors then cut one set to look like stiffening panels on the inside of the gear doors. It is an easy way to make great looking doors with a little work. 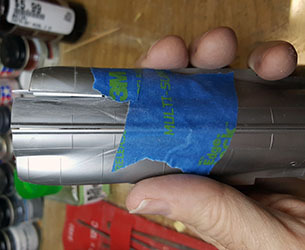 I did not like the look of the silver after it had had some time to dry and sanded it all off and tried again. It still didn't look right so I sanded it all down and here is where we sit. 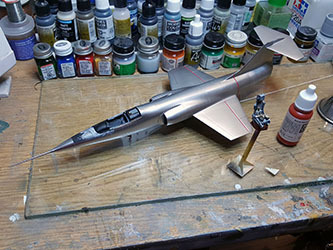 The forward canopies are problematic because of the thin edge of the vacuum-formed part and the silver is a tough color to get right in scale. I still have to do landing gear and early Starfighter wheels and piece together all the different decals to get the right FG-786 tail code. Stay tuned to see how this saga ends.